The whole debate about the question of a new airport for London (or extension of the present airports) is ridden with prejudice, misinformation and self-interest. It should, therefore, be valued with those thoughts in mind. The coalition government´s decision to prohibit any extension of Heathrow, Gatwick and Stansted was a preelectoral sop to voters to ensure their parties´ election - take note that no mention was made of Luton where there are Labour held seats. The expansion of Southend, Lydd and Manston airports together with "London" Oxford smacks of hypocrisy of the highest order. Airports are not just runways and terminals. They are ancillary services, connexions, public transport, taxis, cars, lorries, noise and air pollution. By expanding these airports are you trying to alleviate the problems at other established airports? - I doubt it, you are just creating more problems than ones you are supposedly resolving.. The established airports have the infrastructure in place. London is privileged to have four major airports (plus London City) to serve its and the nation´s needs. The problem is and has been the lack of political will to solve the problems of lack of capacity in the South East. In comparison Frankfurt has one airport, Paris has two while New York has three. Heathrow has grown to full capacity because everyone wants to connect through there - to the detriment of the UK traveller who sees his connexions reduced. Therefore, the need for a third runway is obvious, not for long distance traffic but to ensure connexions with the rest of the British Isles and near Europe(the Benelux countries and Paris). Any limitations on such extra traffic should be based on noise and engine pollution. Gatwick´s new owners say they do not want to expand to a second usable runway. They cannot anyway , until 2019, at least. What they really want is to get everything up and running well before that date so they can present a good convincing business case when the time comes and then show what a mess everything is elsewhere so their case for extension is incontestable(which airport owner would deny the opportunity to expand?). Stansted was pushed as London´s second airport in the early 1970s (and rejected). It has grown by stealth since then. The traffic levels subsequently achieved were probably not even imagined then. Even though there is now a dip in passenger numbers, growth will continue in the mid to long term. Here the basic infrastructure is in place and any improvements would have to be made anyway (especially in the rail corridor). Luton is the one airport not mentioned but in the best position. Forget that the majority of its traffic is devoted to charter and holiday flights (was that not the case for many years at Gatwick?). Luton has excellent connexions on the Midland Main Line(MML) to East Midlands, South Yorkshire and Leeds - which could be improved through electification and even to Manchester. 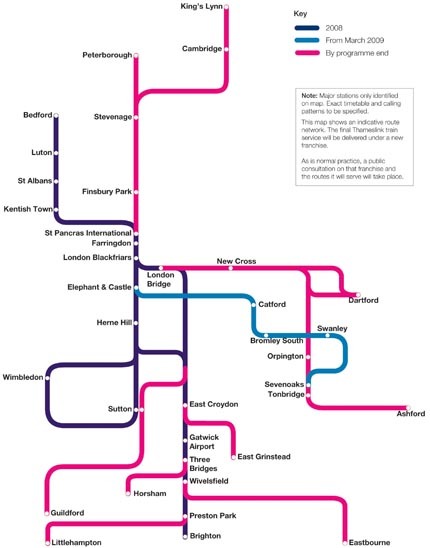 When the Thameslink project is eventually finished then 24 trains per hour will provide direct service to South of the Thames and the South coast. The solution is therefore, based on demand. Heathrow must expand to three runways with the view that that is the limit. Then another airport must be named as its major compliment. By the type of present traffic Gatwick would be the ideal place to lay a second runway. However, the affluent residents of that near area would not be too keen and so would probably ensure it is not built. Stansted was proposed as the second airport and has been trying to achieve that objective. However, it is in an area where it is out on a limb which would need tremendous investment to make it an attractive proposition. 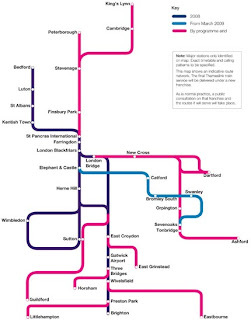 The Crossrail project could give it good connexions to Central London, the M4 corridor and Heathrow if such were the desire. On the other hand, like Gatwick the affluent nimbys would probably put a stop to it. What is left is Luton. This is well connected to both Gatwick and East Midland airports. Customers from south of the Thames will be able to reach it as well as those from north of London who could do so without entering the capital. As said before it is on the MML giving it excellent connexions northwards meaning passengers would not have to put pressure on London´s transport system. Thus our conclusion is that Luton should be focused on as the next major London airport. (this was explained in our blog of 5 July 2010 - Luton, the Next Best Bet?) A second runway should be laid down and land reserved for a possible third and even fourth runway. If not then all the airports should be permitted to expand to at least two runways. The cost should be born by the owners of the airports. If there were free choice in the matter of expansion then market forces would come into play to ensure that the costs to the users do not become prohibitive. The cost to the government would be the necessary upgrading of the infrastructure to the airports (this has to be done anyway so is not extra). The onus must be on public transport and connectivity. Where public transport exists it should be bettered, making it more attractive to use and encouraging the public to leave the car at home. The connexions to London, other cities and other airports have to be a priority to increase the attractiveness of public transport thus reducing traffic and subsequently pollution. Until the love affair with the car is broken then the problems of traffic volume, air pollution and noise will not be reduced.